And now, the exciting conclusion of a tale of two plant catalogs. 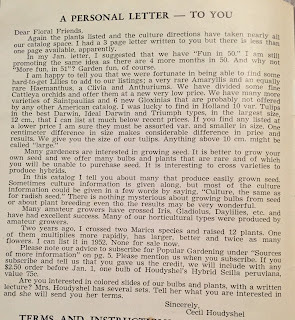 To catch you up, dear readers, we begin a ways back when I fell into a rabbit hole of old plant catalog references, which resulted in my desire to hold the catalogs in my own hands, to read them and find out for myself if Hennessey was a really a bully and if Houdyshel was really a sweet, nice man. First came the Hennessey catalog. Oh yes, Hennessey was a bully. 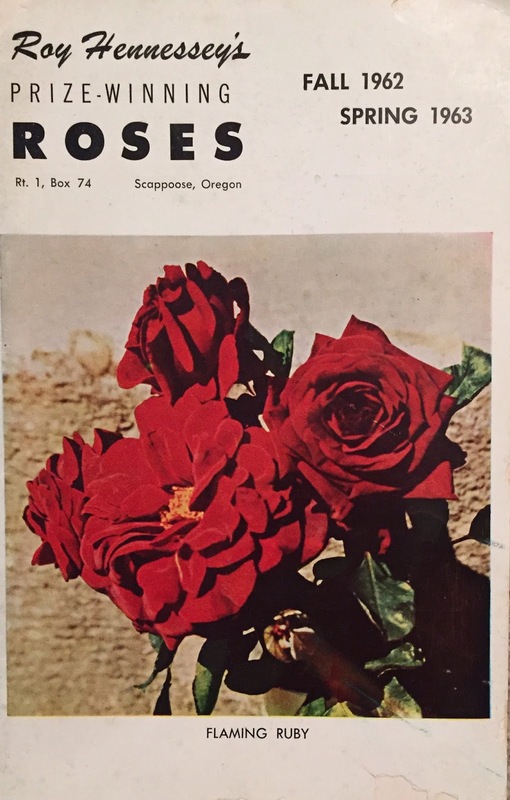 After reading through his catalog, I was afraid to order from it, lest I mistreat one of his roses by gasp, cutting back the roots. No matter that it was published in 1961 and his nursery no longer exists. I was afraid I might order just one of the massing roses, which he refused to sell in groups of less than three, and really six would be better. It took me a while to find the antidote for reading Hennessey's catalog, the cure that would make me forget, if one can forget, such a catalog which ends with several pages of his political views and oh by the way, I couldn't find one of the words he used, "%3/4#$&", in the dictionary. He used that word in his catalog. Yes, he did. Then one day, one fateful day, I found the antidote for Hennessey prescribed by Katharine S. White, one of Houdyshel's catalogs. It was on eBay. I bid on it, waited nervously for a day and then found out I had won the auction. Forget that there were no other bidders. I won! The catalog arrived a week or so ago, and I have been savoring it since then. 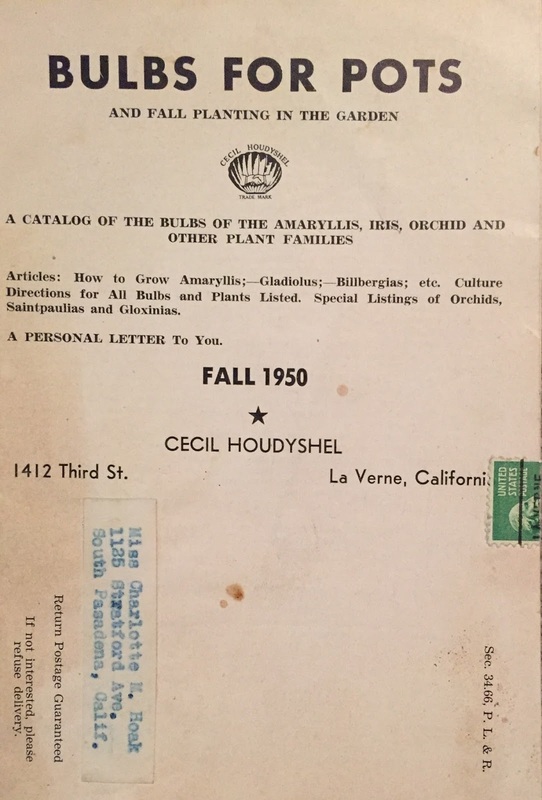 This Houdyshel catalog is a gem, and it is indeed quite soothing, the perfect anecdote to Hennessey. 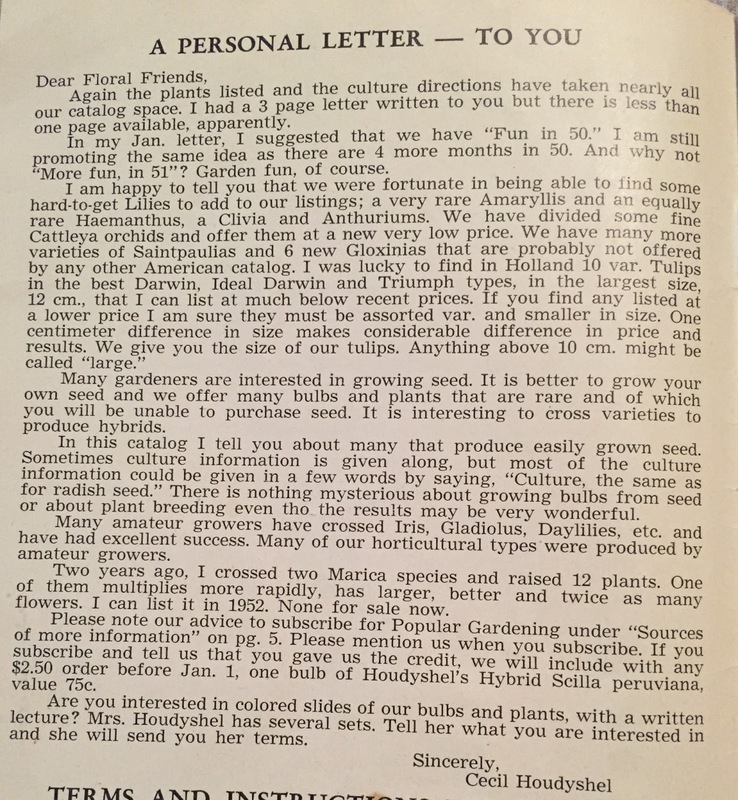 Dear Floral Friends, it begins, with a personal letter. I assure you, Hennessey does not begin his catalog with a personal letter. And there are "portals" to new rabbit holes sprinkled throughout Houdyshel's catalog. Who wants to go down a rabbit hole with me, looking for a book called "Herbertia", which is actually many books, volumes of them? 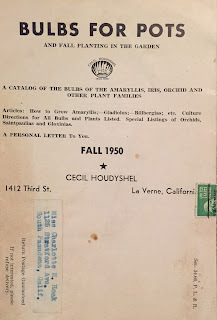 If it were not for the fact that Houdyshel's catalog is 65 years old, I would be tempted to order many of his bulbs. Certainly, his catalog has me in the mood to buy some amaryllis bulbs and maybe some other bulbs for winter forcing. And some African Violets and orchids, for good measure. After all, according to Houdyshel, bulbs and orchids make great gifts. Avoid the crowds, he says, and order bulbs and orchids, and if you are going to give the gift of a book, give the gift of a garden book. Hennessey? Ha! I'll take Houdyshel any day, any time, any century. I always enjoy you dragging me down the rabbit hole of choice. You seem to find the most interesting things there. This was great. I had a similar experience reading THE LITTLE BULBS by Elizabeth Lawrence. Sweet. Friends through time.